Why is the login to Youtube from this TV failed? Login to YouTube from TV failed. This may occur due to change of YouTube API. In order to login to YouTube from television, it is necessary to create a YouTube channel on your account beforehand. Important: Make sure you already have a YouTube or Google Account. 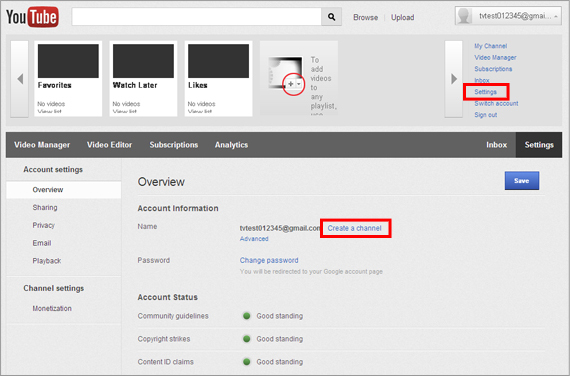 Note: YouTube interface or navigation may be changed in future and differ from the current instruction below. For details, please refer to YouTube Help. Click Sign in on the top-right corner. Sign in to YouTube with your email or YouTube username and password. Click on your YouTube username to display settings options, then click Settings. To create a channel to your account, click Create a channel on Overview. Set up your YouTube username and channel, then click Next. Note: Once you've set your username it cannot be changed. After channel is successfully added, click All done. Important: Make sure the TV is connected to the network. Go to Internet Content menu and click YouTube.